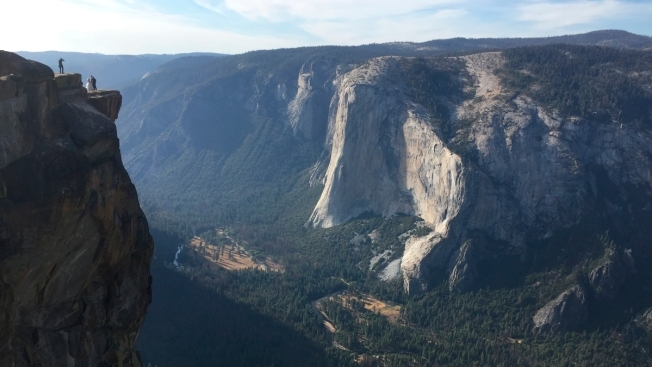 Officials have identified the couple that died in an apparent fall from Taft Point in Yosemite National Park as 29-year-old Vishnu Viswanath and 30-year-old Meenakshi Moorthy. Ian Cull reports. An Indian husband and wife who fell to their deaths from a popular overlook at Yosemite National Park in the western U.S. were apparently taking a selfie, the man's brother said Tuesday. Park rangers recovered the bodies of 29-year-old Vishnu Viswanath and 30-year-old Meenakshi Moorthy on Thursday about 800 feet below Taft Point, where visitors can walk to the edge of a vertigo-inducing granite ledge that doesn't have a railing. Viswanath, who Cisco India said was a software engineer at the company's San Jose, California, headquarters, and Moorthy had set up their tripod near the ledge on Tuesday evening, Viswanath's brother, Jishnu Viswanath, told The Associated Press. Park visitors the next morning saw the camera and alerted rangers, who "used high-powered binoculars to find them and used helicopters to airlift the bodies," he said. Two people have died after apparently falling from Taft Point in Yosemite National Park, park officials stated Thursday. In an eerie coincidence, a man who had hiked to the same spot with his girlfriend captured pictures of Meenakshi prior to her fall, saying she accidentally appears in the background of two of their selfie photos. Sean Matteson said Meenakshi stood out from the crowd enjoying the sunset atop Taft Point last week because her hair was dyed bright pink and that she made him a little nervous because he felt she was standing too close to the edge. "She was very close to the edge, but it looked like she was enjoying herself," said Matteson, who lives in Oakland, California. "She gave me the willies. There aren't any railings. I was not about to get that close to the edge. But she seemed comfortable. She didn't seem like she was in distress or anything." Matteson said Moorthy's pink-haired visage appears in the background of two photos he snapped of himself and his girlfriend Drea Rose Laguillo. He said Laguillo noticed that Moorthy had been captured in their images on Monday after pictures of the two victims were published. Matteson said he doesn't recall noticing Viswanath when he and his girlfriend were at the overlook with less than a dozen other tourists. The couple left the overlook as darkness was approaching, Matteson said. The Indian couple's funeral will take place in the U.S. because the bodies were not in a condition to be flown back to India, Jishnu Viswanath said. The couple was "travel-obsessed," Moorthy wrote on a blog called "Holidays and HappilyEverAfters" filled with photos of them in front of snowy peaks, the Eiffel tower and tulip fields. Moorthy had wanted to work full time as a travel blogger, Viswanath said. "A lot of us including yours truly is a fan of daredevilry attempts of standing at the edge of cliffs and skyscrapers, but did you know that wind gusts can be FATAL???" Moorthy wrote on an Instagram post with a photo of her sitting on the edge of the Grand Canyon. "Is our life just worth one photo?" The couple graduated in 2010 from the College of Engineering, Chengannur, in Alapuzha district of Kerala state, one of their professors, Dr. Nisha Kuruvilla, told the AP. She said Moorthy and Viswanath were both good students who were fond of traveling and had married at a Hindu temple in Kerala in southern India four years ago. 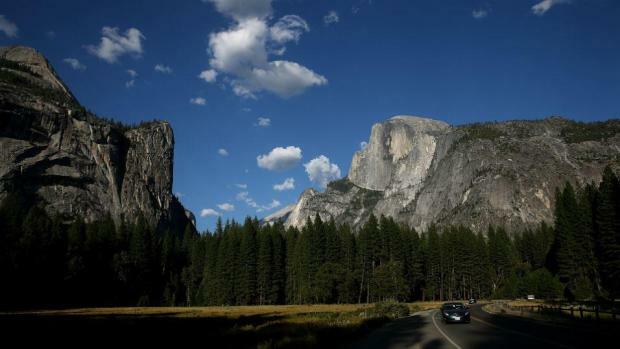 Yosemite spokeswoman Jamie Richards said in a statement that park officials were investigating the deaths and that the investigation could take several days.